YOUR PHONE IS SMART. YOUR HOME IS SMART. 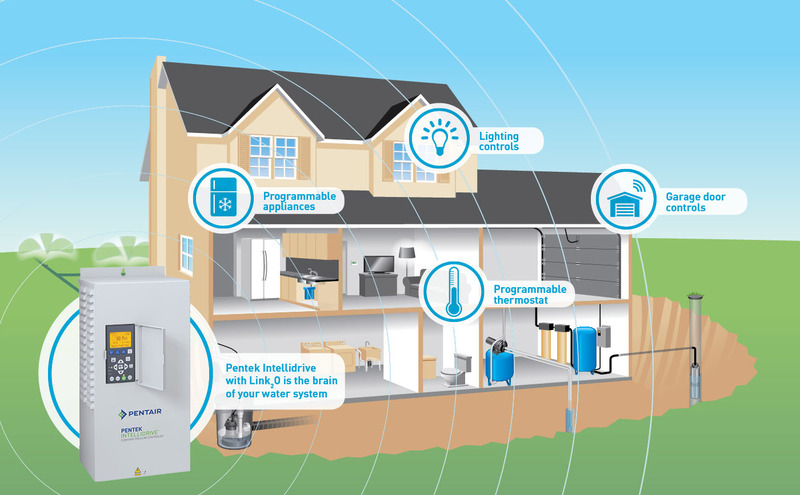 ADD PENTEK INTELLIDRIVE™ WITH LINK₂OTM AND YOUR WATER SYSTEM WILL BE SMART TOO. WITH CONSTANT CONNECTIONS, THE POWER IS YOURS. Whether you’re home or away, 24 hours a day, 7 days a week Link₂O puts the power of the Internet in your control, allowing you to monitor your water system at any given moment, with any device. With Link₂O, you enjoy peace of mind, knowing all you can about your home’s water system. Remember, your PENTEK INTELLIDRIVE™ with Link₂O can also be connected to your contractor to share system information and decide if action needs to be taken. Ask for details! PENTEK INTELLIDRIVE™ gives you the ability to optimize the water pressure in your shower, dishwasher and lawn sprinkler, automatically adjusting, based on the amount of water you use, so you always get what you want. With the PENTEK INTELLIDRIVE™, you get more than a basic system. The connectivity you get with Link₂O helps unlock all of the benefits of your water system.